Development on the HTA version of BirdName has been discontinued. I rewrote BirdName almost from scratch in C# to get a compiled program. You can continue using this HTA version if you choose so, but it will no longer be maintained. Click here to go to the current BirdName page. Translate animal species (chordata) names from one language to another with this HTA. This HTA uses Wikipedia to translate from a "local" language to the scientific name, and from the scientific name to one or more "local" names. Check "Use local language names" to list the available languages each in their own language instead of listing the English language names. Choose the number of simultaneous translations. Click "Hide Settings" to move the settings out of sight (until you restart the HTA) when ready. These settings are not permanent. To make them stick, you will need 2 configuration files with the appropriate settings. Click the "Configure" button to create or edit these configuration files. Pressing F1 or clicking the "Help" button will display some help on usage and configuration/customization. This HTA uses Wikipedia to translate animal (chordata) species names from and to (m)any language(s). You can use this program to translate a species name from one of the supported "local" languages to any of the other supported languages. Next, type the species name in the empty field just below the class selection. The program will first search the scientific name on Wikipedia and then translate that scientific name to the language of choice. Alternatively, you can enter the scientific name yourself, and the program will translate it to the language(s) of choice. With the buttons you can search Wikipedia interactively for the requested translations. If Use local language names is checked, the list of available languages shows the local language names (e.g. "Français", "Cymraeg"), if not checked the English language names are listed instead (e.g. "French", "Welsh"). 1234 simultaneous translations controls the number of translations shown; it ranges from 1 to 4. To change settings permanently, click the button, next to the "Settings" header, to open the configuration files in Notepad (see the chapter "Customization" for more details). Click to move the Settings block out of sight (it will reappear next time the program is started). This program automatically checks for updates. If an update is available, a notification will pop up, asking you if you want to download the latest official release. If you click "Yes" the BirdName download page will be opened in your default browser. Unless you update the program, the notification will reappear next time the program is started. If AutoUpdate is enabled, the program is updated "on-the-fly" without notification (see the chapter Customization for more details). 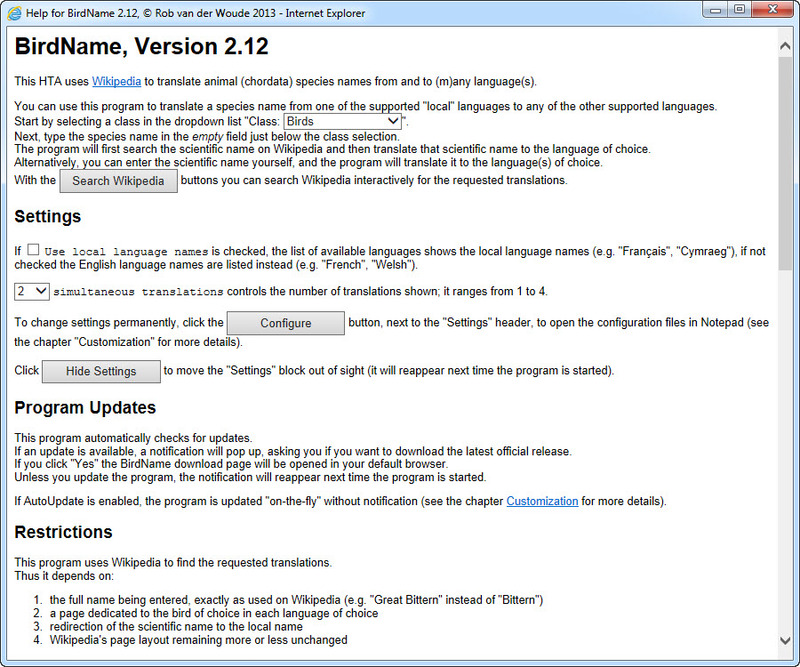 This program uses Wikipedia to find the requested translations. It may be clear that these conditions may not always be met. If no translation was found because there is no dedicated page, use the button next to the "Translation" field to search for the name yourself. Ambiguity, multiple "local" names, or the use of an incomplete name or group name instead of the species' full name, may prevent the program to find the scientific name. That is where the button next to the "Scientific Name" field comes to the rescue. Click it to find the scientific name yourself, or look it up in a printed bird guide. Once found, clear the "Bird Name" field and use the "Scientific Name" field to find the requested translations. If you still can't find the translation that way, this program cannot assist you any further. You may use a configuration file named BirdName.cfg, to customize the window size, default input and output languages and number of simultaneous translations. BirdName.cfg is an ANSI encoded (or "ASCII") plain text file, located in BirdName.hta's parent folder. Note 1: Each of these settings can also be specified on the command line, e.g. Note 2: AutoUpdate=1 will update the HTA to the latest version without any user interaction. Besides the program settings, you can also customize (translate) the captions and button labels. This requires an ANSI encoded (or "ASCII") plain text file named BirdName.lang, located in BirdName.hta's parent folder, where lang is the language code specified by ConfigLanguage in BirdName.cfg (e.g. en). Unicode or extended ASCII characters in all text except button labels must be escaped (e.g. &Uuml; for Ü). You may have to experiment with code page settings when using extended ASCII characters in translated button labels. Open the configuration files by clicking the button, next to the "Settings" header. Change one setting at a time and examine the effect. If the result is a complete mess, just delete BirdName.cfg (and optionally BirdName.lang) to restore the default settings. In the "Class" block, at the left end, choose a class (e.g. "Mammals"), then choose a "source" language and enter a species name in the field in the middle. Select a language for each "Translation" block. Click "Translate" to start the translation. The HTA will first search Wikipedia in the selected language for the bird's scientific name, which will be displayed in the "Scientific Name" block, if found. If no scientific name was found, a button "Search Wikipedia" will appear. Click it to find the scientific name yourself. Once found, clear the "local" bird name field, enter the scientific name in the appropriate field and click "Translate". This may be necessary if the name entered is ambiguous for Wikipedia. The translation fields will be populated with the search results for the scientific name on the "local" Wikipedias. If no valid result was returned, a button "Search Wikipedia" will appear next to the translation field, to allow a manual search on the local Wikipedia. Read the help screen to learn more about customization. The following configuration files change the HTA into a Dutch version with 3 simultaneous translations. Even when overridden, each setting should still be specified in BirdName.cfg. Notes: 1 These configuration files are included in the ZIP file; beta version configuration files should be deleted or modified. 2 Configuration file may change with program updates. As of version 2.12, the version number should be added to each configuration file. If your HTA version is not the latest "stable" release, an update notification will pop up, asking you if you want to download the latest official release now. Clicking "Yes" will open the BirdName download page in your default browser. Setting AutoUpdate=1 in BirdName.cfg will automatically update without any user interaction. 2.12 2013-11-14 The HTA now checks for configuration file compatibility at startup; if an error is found, the default settings will be used, and a popup message notifies the user. This feature is rudimentary right now, as it depends mostly on the version number being added to the configuration files; this will improve in future versions, where the version number must always be present in the configuration files. 2.00 2013-11-09 This HTA can now be used to translate species' names from all chordata classes (i.e. amphibians, birds, fishes, mammals and reptiles), not just birds' names. 1.02 2013-05-21 Bugfix: a change in Wikipedia's HTML code required a modification in the regular expressions the HTA uses. 1.01 2012-03-12 Bugfix: a change in Wikipedia's HTML code required a modification in the regular expressions the HTA uses. 1.00 2011-12-20 First "official" release. 0.21 2011-12-08 First public beta release.